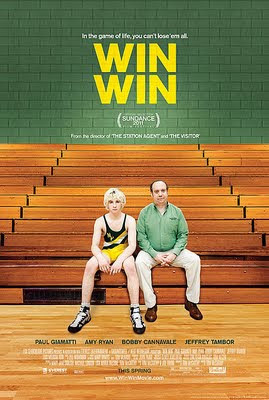 Win Win is a touching and completely relatable story about Mike Flaherty, a lawyer struggling to maintain his practice. With a wife and two small children, he resorts to some dishonest behavior to continue to make ends meet. What?! A lawyer behaving badly you say? What's so different about that? 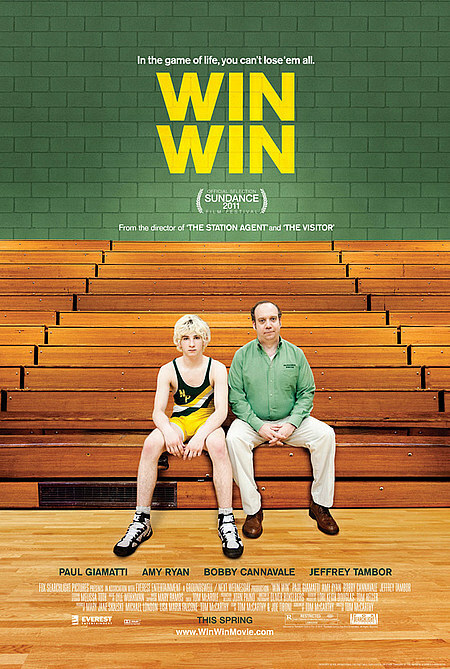 But Paul Giamatti's character is so well-written and his performance is so solid that you never hate his character. His life takes a turn for the better, AND/OR for the worse, when the teenage grandson Kyle (Alex Shaffer) of his elderly client Leo Poplar (Burt Young) shows up at their New Jersey town. His ne'er-do-well mother Cindy (Melanie Lynskey) is nowhere to be found, until when it's most inconvenient. Mike was a former wrestler and is now a volunteer coach at the local school. The underperforming wrestling squad is buoyed by the arrival of Kyle. Even the Flaherty family fully embraces the young boy. Just when things seem to be going swimmingly, guess who shows up to complicate matters? The supporting cast includes a hilarious Bobby Cannavale as his newly divorced best friend Terry Delfino, and a fiercely protective Amy Ryan as his wife Jackie. Jeffrey Tambor is Stephen Vigman, who Mike shares office space with, and also one of the coaches. But the film's break out performance belongs to Alex Shaffer, who plays his character not as a typical movie troubled teen. Kyle's blank affect and monotone voice hides his pain. He is somehow able to overcome his own issues and showers the grandparent he never knew, with the love and attention he himself never got. Sometimes, he acts more adult than the grown-ups in the film. Thomas McCarthy (The Station Agent, The Visitor) continues to give us complex stories and characters who are imperfect, which means they are fully human. There is no over-the-top sentimentality yet I found myself wiping a tear or two. Mr. McCarthy writes about people who are trying to do the right thing, but knows the right thing isn't always the easiest thing to do. Catch it when it comes out on DVD. It's Win Win FTW!